Join the Yargo Trail Crew (YTC) for a day of improving the mountain bike trails. Bring water, work gloves, long pants and sturdy footwear. No open-toed shoes. Bring a change of clothes for after the project along with your mountain bike to enjoy the trails. Meet at the Trail Head parking lot. Volunteers must register through the YTC site link. $5 parking. 770-867-3489. Join us for a ranger-led twilight paddle of Lake Trahlyta. 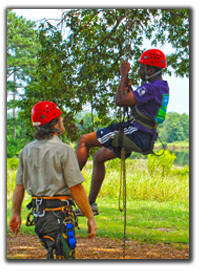 Spots fill quickly so register in advance by calling (706) 745-2628 or stop by the Visitor Center. $10/person, kayaks and life jackets provided. Please arrive at the boat dock at 7:45pm. $10 plus $5 parking. 706-745-2628.